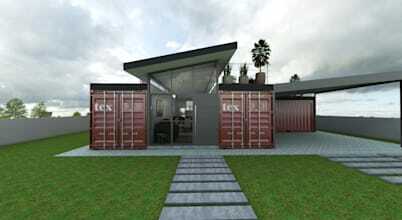 When working with containers, it's important to scale back in terms of your expectations, unless of course you plan to create a home whereby each room is a separate container! Kitchens, in particular, need to be functional as apposed to enormous and we think that this design, which sees the food prep area installed in the far end of a container, works perfectly! A double-sided breakfast bar adds a lot of hidden storage too.